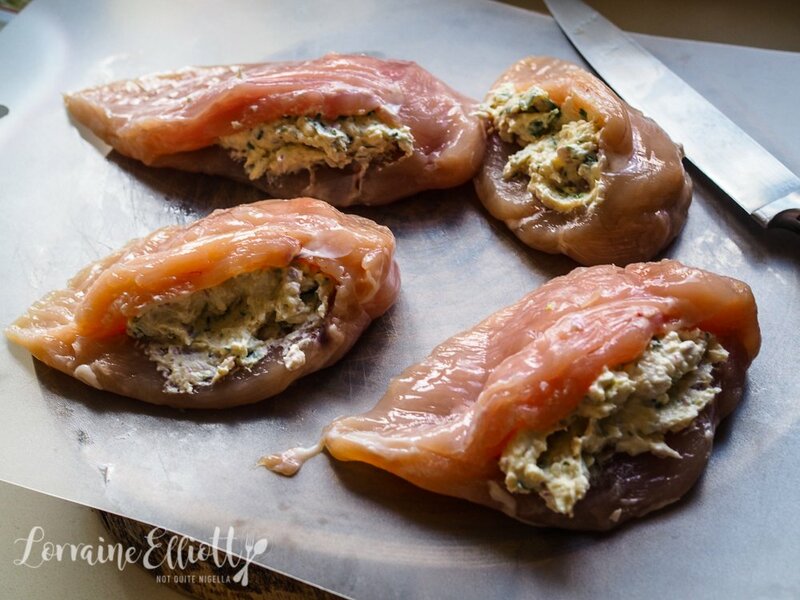 These stuffed chicken breasts are one of the easiest things to make ever and require a quick prep and will have dinner in no time at all. Inspired by a fridge clean out, it's wonderfully versatile and I used the vegetables I had on hand. I have to admit that I was a bit worried about stuffing these chicken breasts. I always thought that it might be hard. I don't usually cook chicken breasts so I don't have a huge familiarity with them. But then I discovered that it's really just cutting a slit in the chicken breast as far as it will go without cutting a hole. Chicken breasts dealt with, I then threw in some potatoes, figs and onions and then the oven did all of the work. 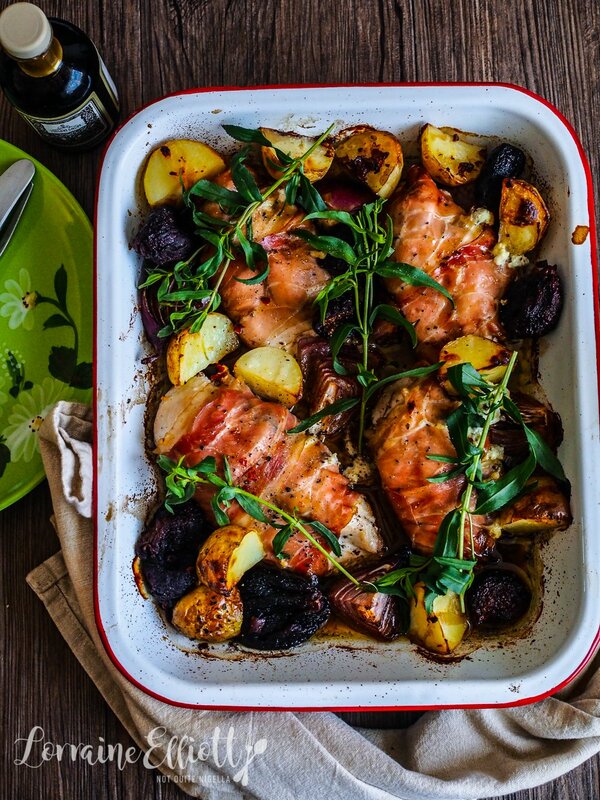 This became dinner for the next two nights and I adored the flavour of the garlicky cheese and tarragon. And I can't believe I thought that stuffing a chicken breast would be a challenge! There are plenty of other things that I found challenging once upon a time. Driving seemed to be one of those things that was meant for more coordinated souls. But slowly, it happened and I love driving. I was talking to Mr NQN in the car the other day as we were driving through Bondi Junction. "I'm so glad that they made the street wider," I said to him as I turned onto Newland Street. "Errrm they didn't actually make it wider," he said confused. "Oh yes I'm 100% positive they did," I answered. "Remember how terrified I was driving down it?" I reminded him. He looked at me with that dry look that he has. "They didn't change it, I think you got less nervous driving down it," he said looking at me like I was crazy. Could he have been right? I guess so. But a part of me still thinks that they made the street wider! So tell me Dear Reader, is there a skill that you have that you thought was beyond your reach? 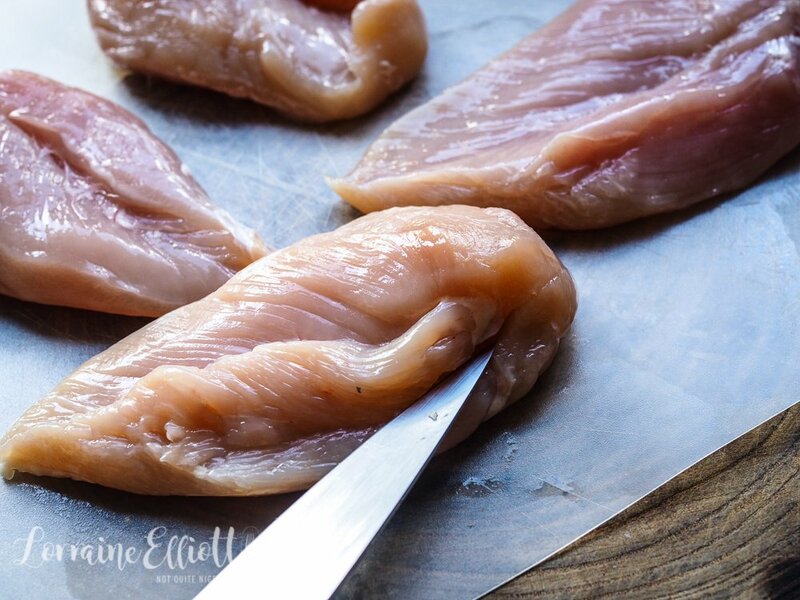 Which cut of chicken do you cook the most? Step 1 - Oil a baking tray and preheat oven to 210C/410F. Soak the figs in hot water for 5-10 minutes. Parboil or steam the potatoes until starting to become tender and drain (I microwave steam them for 5 minutes). Step 2 - Slice through the fattest part of the fillet. In a food processor, blend the cheese, garlic clove and the leaves from a sprig of tarragon. Stuff the chicken breasts with the cheese filling. 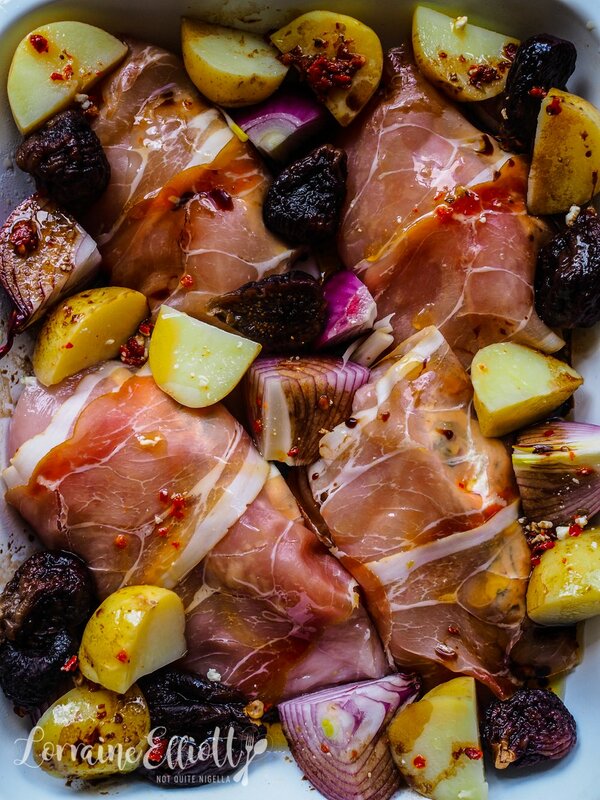 Wrap in 2 slices of the prosciutto and place in the tray with the potatoes, figs and onion. Drizzle the oil on top along with the balsamic vinegar. Bake for 20 minutes. recipeEasy Baked Chicken Sweet Potato Curry Tray Bake! 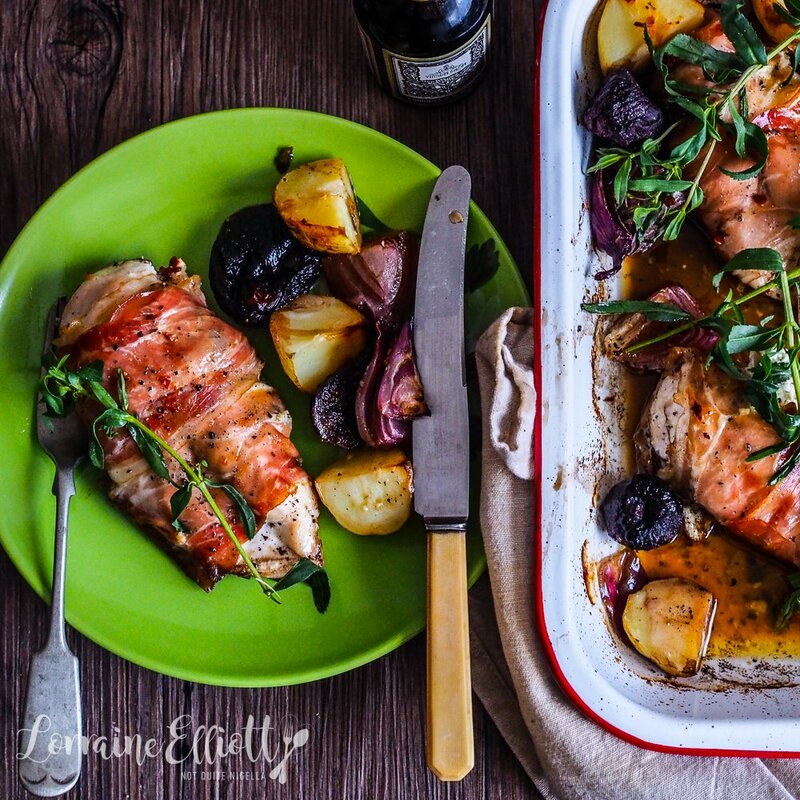 recipe Easy Baked Chicken Sweet Potato Curry Tray Bake!